People will have an opportunity to learn more about India at an event hosted by Indiana State University students on Saturday. ISU's Indian Student Association will present India Cultural Night at 6 p.m. The event will be held in Hulman Memorial Student Union Dede I, II and III. The cultural night will include a fashion show featuring clothing from India and students will perform music and dances. After the presentation, those attending the event will be able to enjoy dinner featuring a variety of traditional Indian foods. The event will cost $5 for Indiana State students and children 12 and younger, $10 for Terre Haute community members and others attending the event. "Basically what we are trying to do in this show is promote diversity and integration on campus between the domestic and the international students," said Apurva Maduranthakam Surenderpal, vice president of the Indian Student Association. "We have been planning on how to get diverse cultures together, and this was a good platform to put it all together and involve everybody who is really interested." The theme for the event is "Raaga, A Fusion of Life," which represents the blends of people from different cultures, both in India and other Indiana State students from around the world who come together in the event, said Sowmya Challa, a doctoral student and treasurer of the Indian Student Association. "We want to show how melodiously and harmoniously we are together in spite of our differences," she added. "Harmony comes when various chords are blending together into one melody." The festivities include different Indiana State students performing in the fashion and dance show. In addition to ISU students, several community organizations such as the India Association of Terre Haute and Indian Student Association's alumni have also provided support for the ISU student group. "We are trying to show people what show we can put up by working together closely," Surenderpal said. The Indiana State students already have shown what kind of show they can perform. 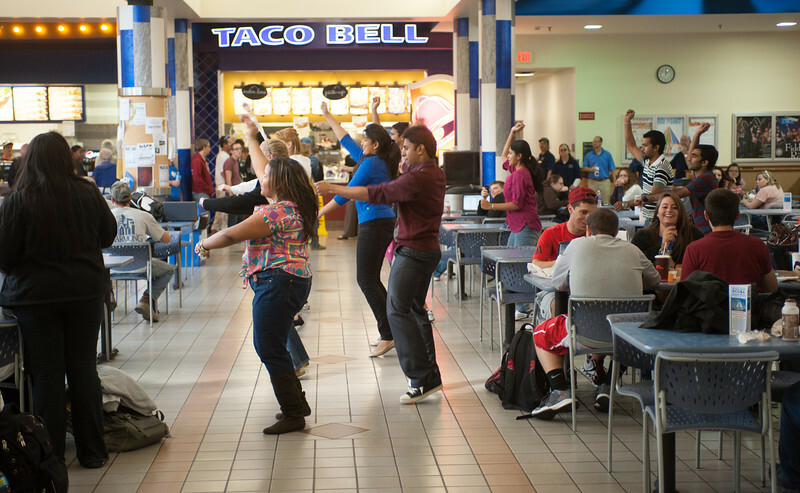 The students teamed with several dancers at ISU to perform a flash mob, a synchronized unannounced public dance routine, at midday Monday in Hulman Memorial Student Union as other students were gathering for lunch. The performance featured several American songs, along with songs popularized by Bollywood, the Indian film industry. "This was kept as a secret because the flash mob means that you break out as an energy at one place to gather people," Surederpal said. She added that the flash mob was meant to bring together students in the Indian Student Association along with the domestic students who worked together to put on the performance. Photo: http://isuphoto.smugmug.com/Other/Media-Services/International-Flash-Mob/i-3MHp39N/0/L/102212flashmob-9926-L.jpg (ISU/Tony Campbell)Students from the Indian Student Association at Indiana State University and other students perform a flash mob at the Hulman Memorial Student Union at about noon on Monday. ISU's Indian Student Association will present Raaga, A Fusion of Life at 6 p.m. Saturday, Oct. 27 in Hulman Memorial Student Union Dede I, II and III.